The armyworm is a common pest of bermudagrass, sorghum, corn, wheat and rye grass and many other crops in north and central Texas. 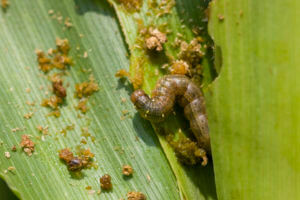 Larvae of fall armyworms are green, brown or black with white to yellowish lines running from head to tail. A distinct white line between the eyes forms an inverted “Y” pattern on the face. Four black spots aligned in a square on the top of the segment near the back end of the caterpillar are also characteristic. Armyworms are very small (1/8 inch) at first, cause little plant damage and as a result often go unnoticed. 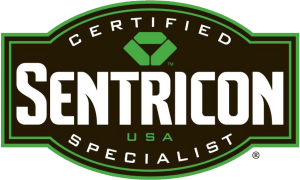 Larvae feed for 2-3 weeks and full grown larvae are about 1 to 1 1/2 inches long. Given their immense appetite, great numbers, and marching ability, fall armyworms can damage entire fields or pastures in a few days. Once the armyworm larva completes feeding, it tunnels into the soil to a depth of about an inch and enters the pupal stage. The armyworm moth emerges from the pupa in about ten days and repeats the life cycle. The fall armyworm moth has a wingspan of about 1 1/2 inches. The front pair of wings is dark gray with an irregular pattern of light and dark areas. Moths are active at night when they feed on nectar and deposit egg masses. A single female can deposit up to 2000 eggs and there are four to five generations per year. The fall armyworm apparently does not overwinter in north Texas, but survives the winter in south Texas. Populations increase in south Texas in early spring and successive generations move northward as the season progresses. Management. Fall armyworm outbreaks in pastures and hay fields often occur following a rain which apparently creates favorable conditions for eggs and small larvae to survive in large numbers. Hay fields with a dense canopy and vigorous plant growth are often more susceptible to armyworm infestations than less intensely fertilized and managed fields. Irrigated fields are also susceptible to fall armyworm infestations, especially during drought conditions. Also monitor volunteer wheat and weedy grasses in ditches and around fields which may be a source of armyworms that can move into the adjacent crop. Look for fall armyworm larvae feeding in the crop canopy during the late evening and early morning and during cool, cloudy weather. During hot days, look for armyworms low in the canopy or even on the soil surface where they hide under loose soil and fallen leaves. A sweep net is very effective for sampling hay fields for fall armyworms. When fields are wet with dew, armyworms can stick on rubber boots worn while walking through the field. Small larvae chew the green layer from the leaves, creating a “window pane” effect and later notch the edges of leaves. The key to managing fall armyworms is frequent inspection of fields to detect infestations before they have caused economic damage. Once larvae are more than ¾ inch long, the quantity of foliage they eat increases dramatically. During their final 2-3 days of feeding, armyworms eat 80% of the total foliage consumed during their entire development. The density of armyworms sufficient to justify insecticide treatment depends on the stage of crop growth and value of the crop. Seedling plants can tolerate fewer armyworms than established plants. Infestations of more than 2-3 armyworms (1/2 inch or longer) per square foot may justify an insecticide application.